When you wanted copy or move different folders files to a flash drive or other places, how would you do this ? 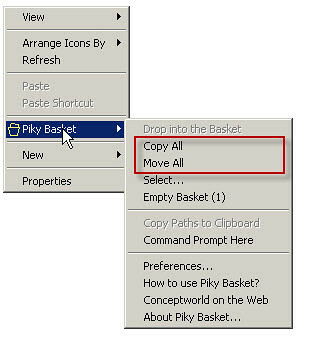 Use drag and move function with open multiple window or using window explorer ?All these methods are too troublesome, with a free “Piky Basket” this small software, you can use right-click menu, add a “small basket” feature, allows you putting the files in batches thrown into In the “basket”, and then managed with paste them all with once at target folders. The concept of Piky Basket operation in quite simple, is to establish a temporary storage space,then memorize the files or folders that you selected then copy and paste the file or folder to selected folder. Then selected the target folder, such as flash drives, external hard drives,etc, right-click select ‘Piky Basket’ –> ‘Copy All’ or ‘ Move All’, the basket will be empty. 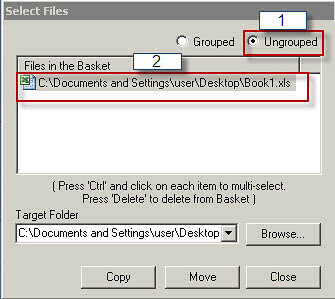 Select ‘Ungrouped’ and click the file that need to delete,then press ‘Del’ button,the file will permanent delete from the basket . Moreover,you also can right click select ‘Piky Basket’,then click on the ‘Empty Basket’,all the files or folder will be delete. 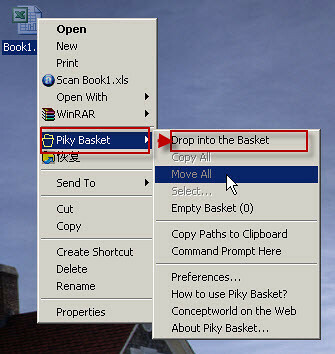 Download Piky basket ( freeware ) and supports Window all .